Yewbdar could you talk a bit about yourself? A bit of my personal background, my full name is Yewbdar Anbessie Setegn. I was born June 25, 1973 in Addis Ababa, Ethiopia. I am married and a mother of two sons and a daughter. 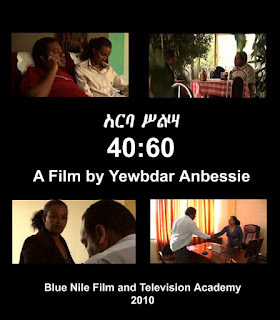 Professionally, I studied directing at the Blue Nile Film and TV Academy in Addis Ababa. For the past twelve years I have participated in various film productions, which include TV dramas and feature video films. In addition, I have acted in stage plays and worked as an advertising model. What was your experience with cinema while growing up? 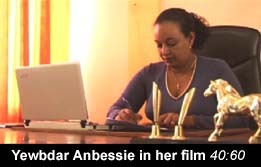 Fortunately, I grew up in Addis Ababa, where one of the largest cinema halls, Ambassador Cinema, is situated. So I had the exposure of cinema since my childhood. Ethiopia is slowly developing a cinema culture, could you talk about this development? Our country has been in a deep sleep for a long time without making significant achievements in this domain, although it is a country with an ancient civilization attracting international interest. This is unfortunate especially for those in the film profession and for film enthusiasts. According to the documents available, it was before 1917 that the first film was screened in Ethiopia. At that time people considered cinema as something evil, and for that reason the first cinema hall was named “Satan Bet” which means the house of the Devil, and continues to hold that name today. The number of cinema halls increased and started attracting a greater number of viewers at the time when fascist Italy temporarily occupied Addis Ababa between 1935–1940. The first 35mm feature film, Hirut Abtwa Manewu? was produced in 1971. This 90-minute film, which means who is the father of Hirut?, was shot in black and white. The next film, Guma (To pay in blood) was produced in color, as was Bhiywot Zuriya (Round Lives). This period was considered the Golden Age in the history of Ethiopian art, music, literature, and painting because of the significant advancement and changes that occurred. Nevertheless, this era that provided such a sense of hope for the future of modern Ethiopian culture was forced to take another path following the socialist revolution of the military regime which came to power in 1973. During this time the film The Unknown Famine by British documentary filmmaker Jonathan Dimbleby was broadcast in Ethiopia revealing the truth of the disastrous famine in Ethiopia, igniting people’s consciousness of the importance and necessity of filmmaking as a means to contribute to the advancement and progress of society. These events influenced the formation of the government-run Ethiopian Film Corporation developed in 1986, encouraging young Ethiopians to travel to Eastern Europe to develop knowledge and skills in the various areas of filmmaking. Though there were not many efforts in creating a filmmaking infrastructure, the government did give critical attention to using expertise in documentary filmmaking for promoting and propagating its own agenda and mission. 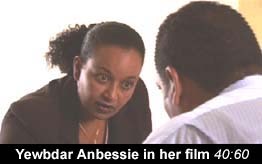 By then Aster by Solomon Bekele was the only 35mm color feature film that had been produced. The fate of the sole filmmaking center since the fall of the Derg regime was unfortunate. Under the proclamation made in the year 1999, it lost all of its facilities and equipment, sold to the highest bidder, and all of its employees were fired. Since the past few years, Ethiopian cinema is going through tremendous change and progress in video production, originally initiated by individuals who have a burning passion and desire to promote the profession, in which not less than 450 video films have been produced and screened to the public in the past seven years in cinema halls all over the country. Nevertheless, the quality of the film production is still under question. There is a need for more energy and courage to take it further, and for this reason we are making a variety of efforts to enhance its professional capacity. The Ethiopian Film Initiative supports Ethiopian filmmakers and the development of an Ethiopian film industry. Are you involved with it in any way? Not directly, however once, I had a chance to attend a documentary filmmaking workshop organized by the Initiative through Blue Nile Film & Television Academy. What role do you see yourself playing in the development of Ethiopian cinema? Because my husband Tesfaye Mamo is a renowned author, playwright, and pioneer film director in the Ethiopian video film industry, our daily life is directly connected to film and related professional activities. Tesfaye Film Production and Promotions (TFP) established in 2000, is one of the pioneers in the Ethiopian Film industry. Tesfaye Mamo is the founder, owner and managing director of the company. I am the Assistant Manager and Production Manager. What are the objectives of the company, Tesfaye Film Production? It is an Ethiopian-based production company engaged in the production of feature and documentary films, TV series, educational radio and TV spot dramas and various promotional activities. Could you talk about your film 40:60? My short film 40:60 is a student film of the first group of students in the Blue Nile Film and TV Academy directing class. However the film focuses on the major and common problems of corruption in Ethiopia and third world countries in general, which is a huge challenge for the young generation. 40:60 is the code for a bribe, which forces a young inventor to share his “cake” in order to win an award for his project. In addition to our company’s many projects, I work as an independent filmmaker with all the challenges that go with it. I am currently in preproduction on a docudrama, at a remote location about 700 kilometers from Addis Ababa. “Geda System, a Blueprint for Democracy” traces the traditional democratic governance practices of the Oromo people of Ethiopia compared to modern democracy.